Late in the morning of Tuesday, Feb. 8, 2011, the Filipinos were shocked of the breaking news that former Philippine Army Chief of Staff Angelo T. Reyes was dead several minutes at the hospital. The news said that while visiting his beloved mother's grave at the Loyola Memorial Park, Reyes shot himself at his chest and was rushed immediately to Quirino hospital by his two sons who were at a distance with him at the cemetery at that time. But several minutes later at the said hospital, Reyes was pronounced dead by his attending physicians. Reyes before he died, according to the news, was able to utter "sorry" to his sons. A remorseful final statement for his misdeeds which his family would be grievously affected. 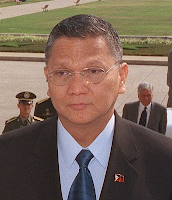 The reports said Reyes' "sorry" word isn't intended for his recent alleged implication to military corruption which unearthed by a whistleblower. Reyes was a good military general, well-respected by his fellow senior officers and junior military officers as well. After he retired from a military service he was given a Government cabinet post by President Erap, then by President GMA and by the present President PNoy as Energy Secretary.